A BPMN example gallery gives you access to a series of well-created BPMN diagrams both for new and experienced BPMN designers. All examples are in vector format, available to download and redesign. 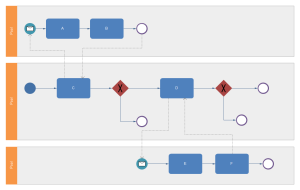 BPMN uses graphical notations for designing your business process, so that everyone is able to understand and communicate the procedures in a standard manner. If you are looking for ready-made BPMN examples and templates, here is the right place. Through Edraw BPMN diagram software, all the templates can be easily customized, just download and add required symbols, connect symbols with smart tools, and change the appearance. Equipped with advanced formatting functionalities, it's fast and easy to apply a professional and visual-appealing look with only a few clicks. Besides, abundant ready-made BPMN symbols makes drawing incredibly fast and easy. 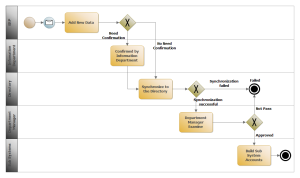 Please click how to create a BPMN diagram for further information. Also, you may get a better understanding about BPMN by reading Basic BPMN Knowledge. 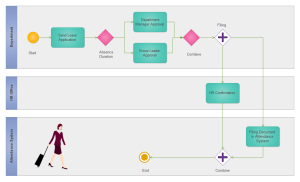 This well-created BPMN example helps you get better acquainted with BPMN diagram. Download the template to study and use. An editable BPMN example is provided on request. Users can download and make some changes on this template to have a fast design. Here is a BPMN example showing the specific steps of shopping process, which is available to download and edit for your own design. An online shopping BPMN template is provided to benefit you, which is flexible, helpful and good-looking. A finely designed BPMN template is readily available, through which users can create nice BPMN diagram with the least effort. To help our users with a clearer understanding of BPMN diagram, we provide this example for reference. Easy to download this vector file at anytime you want. 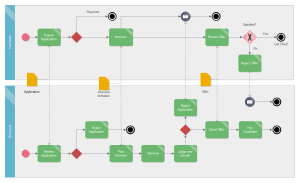 A customizable BPMN example is prepared for users to learn and apply. Click the picture to have a full view of the example and download it for your own use. Click to enter the template page and download this customizable template for your own BPMN diagram design. 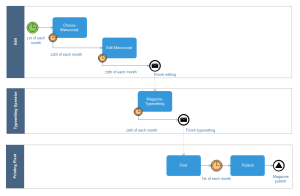 We offer this simple BPMN example as a reference for new designers. You can have a quick start using this vector file as a template.